Camera’s IP address is static. Camera has been placed on port 4440. Login to your router using the address 192.168.0.1. If you haven’t changed your login details (and you definitely should) the default username is ‘admin’ and default password is ‘password’. Name: It doesn’t matter what you put here, it’s just helpful to put something memorable so that you can associate the rule with your IP camera in a moment. Type: Select ‘TCP’ in the drop-down box. Start Port: Enter the port number of your camera, in this case 4440. Finish Port: Enter the port number of your camera again, 4440. Click the ‘add’ button under the ‘Inbound Services’ table to add an inbound service. (this means that the rule applies to any traffic coming into the router from the internet). Service: As shown above use the drop-down menu to select the service your created in the previous step. As you can see we called ours ‘IP Camera’. Send to LAN Server: input the local IP address of your camera in here. In this example we would enter 192.168.0.90. WAN Users: Select ‘Any’ to allow access to your camera from anywhere on the internet. Log: You can choose to log actions created by this rule or not. Beware that if you choose to log these actions and your camera is publicly available you may find the log rapidly filling up. That’s all there is to it. You router should now be configured so you can access your camera externally. You should try it from the internet to see if it works! Netgear routers do NOT support NAT Loopback. Put simply, this means that you cannot test your EXTERNAL or WAN address from a LOCAL computer. You must be on an external network for your external connection to work. If you have any questions please leave your comments below. It sounds like your router is blocking the incoming requests to view the camera. Try adding the firewall rules as described in steps 2-6 and remember to point the inbound service to the local IP address of your camera. If you can access your camera then it sounds like you have configured everything correctly. The reason you cannot view the actual image from the camera is probably unrelated and I would guess the browser you are using is missing the plug-in required to view the image such as Active-X, Java Applet or Flash etc. Find out what plug-in your model of camera uses and install this on the remote computer to view the images. I could really use some of your expertise. I've spent hours trying to view my camera over the internet, via a NetGear DG834 router. I've set up the camera's IP as static, configured the Service and Firewall Rules to allow access and conigured the IP and port (4440). I've even run a port scanner to check that the port is responding. In short, I can view the camera on the LAN, but not the WAN – can you offer any advice? When I go to my camera in IE, it simply times out. My bet is that you have configured the router correctly and it is working fine. NAT loopback can cause problems when trying to access your camera using your public IP address from the same local network the camera is on. Try accessing it from somewhere else on the Internet and you might find it's fine. This is fairly common for routers to block this kind of traffic and it's normal to have to use a local IP address when on the local network and a public IP address from the Internet. I have set up my IP camera as noted in the above. I can view and record on internal network but cannot view from the internet. We need more information Mike, such as which external address you are using etc. Can I set a random external port number and link that to the 4440 internal port? I don't think the mapping of ports is possible in a Netgear router I'm afraid, so I would stick to simply using a non-standard port in the camera and port-forward the router for external access. Hi i could do with some help regarding my camera i am using a belkin N1 Vision and cannot see my external IP in the settings tab on the camera and the router say the upnp port is 8080 should i use my ip address with 8080 at the end or do i need to set up another port to use as stated above? Hello I have just bought a wireless network camera Panasonic BL-C111 and using Negear DG834. I did follow the steps above. Everytihg went fine, but my router just does not recognise the camera at the “UPnP” section, however the router does recognise the the camera when i check the “attached device”. How can i solve this problem, because I cant forwarding port if the ADSL routed doesnt recognise the camera as UPnP device. UPnP is simply a tool to help the setup of port-forwarding rules automatically. If it's not working you can add the rules yourself. The guide above shows you how. If your camera is on the default port 80 then substitute the port number 4440 above for 80. Also remember that with a netgear router you will not be able to test this from the same local network due to NAT loopback. You will have to test from another computer on the Internet. Hi Danny. Well, first thing is that it is possible to access your router so we know that external access is possible. Next you need to double check what port your camera is operating on and for ward THAT port through the router. The DG834 does not port map so you can't, for instance, forward port 8080 to port 80. Your router is on port 80 so you need to choose a different port number. additioanlly, be sure that the camera is on a static local IP address and you confirm you can access the camera on the local address. I presume you've gone through the setup in this post? If so, you've either not completed it fully or there is a problem with your router. You may find you have to restart the router for the settings to take as well. One other thing… I know that virgin do not block ports, so the issue has to be with your routing. i have a Netgear MR814v3. I bought a IP camera which i was able to connect via cable, but i cannot via Wireless. what determines how many computers can access my camera from the internet at the same time? All camera's will have a theoretical limit to the number of simultaneous connections it can have (between 20-50 depending on model. What you'll find though is your broadband upload speed is the bottleneck when accessing across the Internet. The faster an upload speed you can get from your ISP the more people will be able to access your camera over the Internet. Greg, I now have five panasonic camera's on our network but can only access one port from the internet. Do I need to set up a service for each camera on the DG834g or can I use the range ports 50001 to 50006 using the settings above? They can all be viewed from the lan. I would set up a service for each camera as you would need to point the port number (50001 to 50006) to the specific local IP address of each camera. You could set up one service covering a range of ports if it allows you to assign that service more than once in the Firewall Rules though I guess. I've never tested that. No problem. That's why we write them! i want to acess my cam in outside pls how to configred my cam this router. The WGR614 is not a lot different to the instructions above. Follow the above and you should be fine. i’ve configure my router and it seems that i don’t have any problem accessing my CCTV using local LAN but my problem is that i can’t access it from the outside my LAN (internet). i’m using D-Link D-634M router and a firewall (hardware). My modem is connected to my firewall before i connected it to my router. This makes port-forwarding quite complex. You have to forward one firewall to the other before you forward the camera through. I'd suggest running just the one firewall. I’m using a Netgear DG834PN router and have 4 panasonic IP cameras on a LAN that are viewed fine. I’ve tried setting up Panasonic’s viewnetcam service but am unable to get access remotely. I picked up on another site that this might be because of the need to configure ports, hence to this site. The maintenance page of the camera shows the port as 80, but I can’t see an option to change this. I have tried using this to set a service on the router, but the response is that this is already being used (by the router?). Is there something else I should be doing to resolve? Finally, to actually access the camera remotely, is this just a case of entering the router’s global address? With 4 separate cameras, I’m not sure how you’d then access four separate services to go from router to camera. Sorry if this is an obvious question! Yes, to access your cameras from the Internet you would need to use your global (or public) IP address. Once you set up the viewnetcam account (which I advise you do on only 1 camera and disable on the rest) this will become your global IP address which you use to access your cameras from the Internet. You are right to wonder how you access each camera individually if you only have 1 global address. To do this you need to change the port number in each of your cameras and then you can specify the port for which camera you want to view. 1) Change the port number in each camera. I suggest using port 4440 for camera 1, 4441 for camera 2, 4442 for camera 3 and 4443 for camera 4. To change the port number enter the setup pages of each camera and on the first page (network settings) click on the link that reads "static". This will display that camera's local IP address and the top entry is the port number (which will be on port 80 by default). 2) Then set up a service for each port in your router. You may have to create a custom service for each. (use TCP as the protocol). When setting up the firewall rule select your custom service and point it to the local IP address of your camera. So, for example, if your first camera can be accessed using 192.168.0.253 and is on port 4440 then you must select the 4440 service and when it asks "send to LAN server" that is the 192.168.0.253 local IP address of the camera with the corresponding 4440 port number. 3) Finally remember that when your cameras are no longer on port 80 you have to expicitly specify the port number. So on the local network an example would be 'http://192.168.0.253:4440&#039; and from the Internet it would be your Viewnetcam address followed by ':4440'. Greg – many thanks, worked first time! I have a separate problem in that the camera address + port is also now different for the Netstreams system, but I can fix this separately. Thanks again, really helpful. Thanking you from my bottom of my heart. Hi I have put all the settings in and can access the cameras over the internet but cannot view any pictures, java is installed. Hello the Greg Dec.29th comment above has left me confused. The DG834G router allows DDNS to be configured. My question is do I need to configure both my router and one of my camera’s with DDNS. I thought I was able to configure only my router to run the DDNS service for me. I have set up a standalone computer and set up plysoft freeware software to run as a webcam server. I only have one camera connected for the moment. I have a netgear dg834g router for internet. I have created a web page by the software. I can connect to the server/camera locally using 198.162.0.10 through other computers in the house. I have set the router to point at port 8080 as identified in the software. Problem is that I cannot connect from outside using http. I have set the software setting to http. I have used ‘whatismyip’ to identify the ip address. I'm not familiar with the software you are using but it sounds like the camera is on port 80 so you would need to forward the HTTP service (port 80) in the Netgear router to the local IP address of the camera to establish an external connection. I would ask you to help me. * Camera’s IP address is static. * Camera has been placed on port 8005. I have set up the router following step-by-step the instructions above; now I can view and record on internal network but cannot view from the internet. Also I tryed accessing to the camera directly writing in the browser myhost.dyndns.org:8005 but the result have been the same. I’m searching to solve the problem sice two weeks without success…I don’t know how to do and I’m becoming mad….Is there among you any good soul who is willing to take me step by step to solving the problem? It sounds like your port forwarding rule (in your router) is not set up correctly. Then when you set up your custom service in the router use port 8005 as the start and end port. Finally when configuring the firewall rule select your customer service and where is says 'Send to LAN Server' input the local IP of the camera which is 192.168.0.80. All other settings should be as above and that should be it. Test from an external connection such as a 3G mobile or a computer from another location on the Internet. Greg – I hope you are still somewhere out there! I have just taken delivery of 5 Mobotix cams (from your good-selves!). I’m setting one up first to see how everything works and for that one it worked straight out of the box. However, like everyone else on this thread I would like to be able to see my cameras from outside my LAN. I have a Netgear DG834 and have followed your instructions. I have also set up an account with dyndns to get around the dynamic IP addresses from my ISP. So far so good. I have set up my first camera on port 8061 with the static IP address 198.168.0.61 I can access the camera over the LAN using 198.168.0.61:8061 and I can also use the dyndns address http://XXXXXXX.homedns.org:8061 from within the LAN quite happily. However, when I try to access remotely (using 3G on my phone or using logmein to access my wife’s computer which is outside of the LAN) – Safari is telling me it cannot access the page ‘because the server where this page is located isn’t responding’. I’m not sure if the router is the issue or the camera, but I’d dearly love to resolve so I can set up the other cameras and move on to VOIP settings? Can anyone help me with my y-cam black, i have a netgear dg834n and i can view the ycam localy but cannot get to see it over the internet. i have ddns set up on the camera because i have a dynamic ip and when i put the host name into the address bar it takes me straight into my router and not the camera. i cannot set up ddns on the router as the drop down menu doesn’t give me a choice of providers, and i can’t put my provider in manually either. I have spent months trying to get this to work and y-cam support is useless they don’t answer to any queries.Please help. You won't be able to use your dynamic DNS address from the same network as the cameras. Try using the address from another machine in a different location and use the local IP address when you are on the local network. This is called NAT loopback. See Step 7 above. I need information on my wireless Y-Cam Black too. I bought it last year and was successful at setting it up for local and public network access with Virgin Media as the ISP. It was operational for many weeks, but then became inaccessible on the public IP address. Absolutely NOTHING had changed on the setup, and the public IP address has not changed for a long time. I power-cycled the cable modem and the wireless router and the public connection became available again, but access was lost again a week or so later, and repeating the power-cycle method was not successful. The camera has a static IP address, the ports had been forwarded correctly (as proven by public IP address access), and it is still available on the internal network; it is also available when the public IP address is accessed from the internal (local) network, but when the public IP address is called from any other network (including ones it had been accessed from previously), I get a ‘cannot access webpage’ message. Can anyone help? I’m mainly accessing the Virgin Media public IP address from a TalkTalk service, but I doubt that TalkTalk would prevent access to the Virgin Media public IP address, would they? I would agree with a poster in that Y-Cam support are not very helpful – they take a long time to reply and generally do not read messages correctly. Thanks in advance. Never heard of this problem before. It seems very unusual that the camera is accessible from the Internet but not from certain ISPs. The firewall rules haven't been filtered at all have they? Check to see if WAN users are set to 'all'. 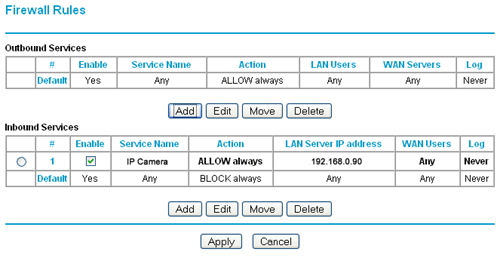 I have IP Camera but it is not working over internet but it works in the LAN but not working in the WAN. And i have LinkSys Router at home. What is your recommendation about which Router should i use which have Wilress and Ethernet port opetion. By the way the public IP is always changing by Internet provider. Please tell what to do about it, to make my IP camera to be accessed any where in the world. Sorry to ask a really silly question but I’m puzzled. I now have my wireless IP cam set up and can see it from my home laptop. I have just followed the instructions above so that I can view it whilst on holiday, butwhat I don’t understand is what I type in the bar on the remote PC to c? My laptop IonnectP address ? Or my IP cam IP address ? Or my router IP address ? If all the Netgear routers have the same default IP address, how will I find mine ? Sorry, I know it’s probably really obvious ! Routers have 2 IP addresses, the local address and the public address. The local IP address is what you see from inside your home on the LAN (local area network) and is typically 192.168.0.1 for a Netgear router. You can't use that to view your camera from the Internet as that can only be accessed from the LAN. The public IP address is given to the router by your ISP when you first power your router on and it connects to the broadband service. This is the address you would use to access your camera from the Internet. You can find this address by visiting the website http://www.mycamip.com from the same local network as the camera. john again new to this . Only question is what do I do if my ip is not static? Ihave problem with remote viewing..i have checked port and it says closed..i have a netgear vmdg280…i have gone to setting on router & added port 80 & 80 plus my internal ip address but when i checked on a website it says port not open..
does the external ip address change – i have followed all the steps in port forwarding but i cannot see the ip camera from the internet. It depends on your ISP. Usually you need to request a static IP at a cost. You can check your current external IP by going to http://www.mycamip.com. If you visit this on different occasions and the address is different, you know it's dynamic. If it is dynamic, investigate a DynamicDNS service. Most cameras and routers support this. Really helpful Blog but I am missing something. What am I missing here. YOur help will be appreciated. I think the issue here is you have a newer version of Netgear router. From the information given above though I think you should have successfully set up port-forwarding on port 4440 to the IP address of 192.168.0.100. So as long as the device on 192.168.0.100 is listening on port 4440 you should be fine. Is it not working for you?! I am new at this, but how do I find out what port my camera uses. My IP camera is a Tenvis JPT318W. Thanks, that would be a big help. God bless.